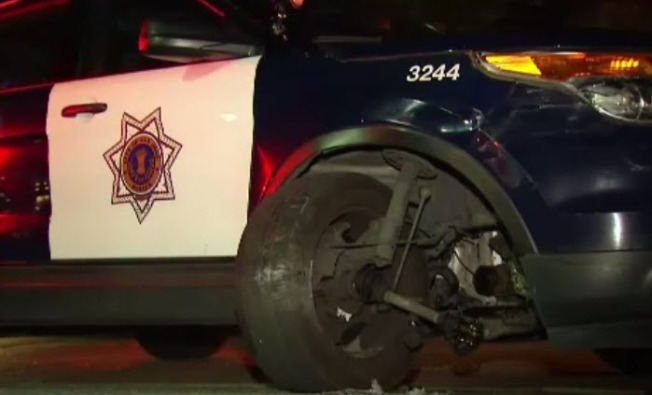 Police in San Jose were searching for suspects in a stolen pickup truck and two other suspect vehicles Monday evening after one of vehicles rammed an officer's patrol car, according to the San Jose Police Department. The incident occurred in the area of Teatree Court and Thornton Way in San Jose when an officer spotted a Chevy Silverado truck that had been reported stolen, police said. As the pickup was leaving the area, a white Chevy Tahoe believed to be associated with the stolen vehicle rammed the officer’s patrol car. The officer’s vehicle sustained major front-end damage, but the officer was not injured, police said. The stolen Silverado, Tahoe and a gray BMW all fled the area after the incident and were outstanding, police said.